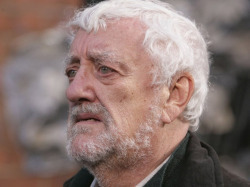 If we hadn't realised it before, the last couple of years of Doctor Who (and indeed the NY episode in particular) have firmly established Bernard Cribbins as a national treasure. For those of us only familiar with the new adventures, we might not realise that Wilf was actually the 2nd time Cribbins has played one of the Doctor's companions. The first was back in 1966 when he played Tom Campbell, a policeman, who got caught up with Peter Cushing's human scientist version of the Doctor in the film Daleks - Invasion Earth 2150 AD. It sounds pretty diabolical, but that doesn't mean we're not excited to see it get an airing at the BFI Southbank on Saturday 16 January. To celebrate his recent recognition at the BAFTA Children's Awards, Bernard will be on hand for a special talk beforehand discussing his career from Jackanory to The Wombles, Wurzel Gummidge and of course Doctor Who. Tickets are on sale now but be quick there's not many left.